Empress Leilia butterflies (Asterocampa leilia) are quite common here in Arizona, especially in areas like Tucson with abundant Hackberries (Celtis spp. ), the Empress Leilia's larval food plants. 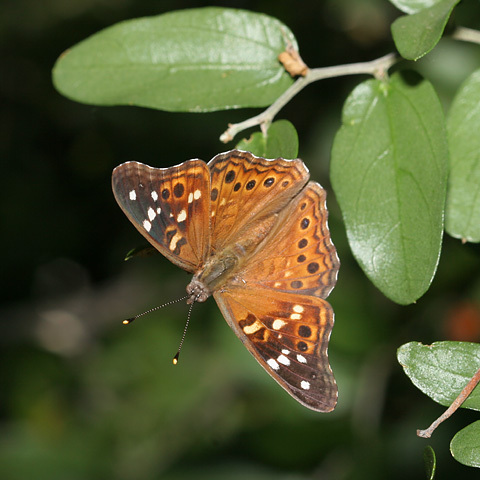 The Empress Leilia pictured below is resting on the leaf of a Spiny Hackberry (Celtis ehrenbergiana), and this butterfly may well be a male Empress Leilia because the males will spend much of their time waiting near their larval food plants for any receptive females to appear. Male and female Empress Leilia butterflies are quite similar in appearance. Their dorsal wing surfaces are a richly colored chestnut, while their ventral wing surfaces (which show when the butterflies have their wings closed) are a much duller and more heavily patterned brown and gray. 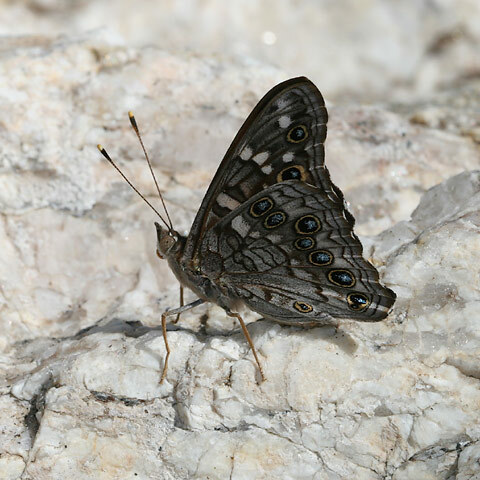 The Empress Leilia is very similar to the closely related Hackberry Emperor (Asterocampa celtis) which is also found here in Arizona, but there is a distinguishing difference between these two butterfly species that helps to identify them. Empress Leilia butterflies have a solid dark bar on their forewings, while Hackberry Emperor butterflies have two dark spots instead. 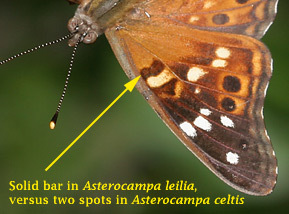 These distinguishing markings can be seen on both their dorsal and ventral forewings.